Finding the perfect wedding dress requires patience, time, care, attention and a lot of inspiration. 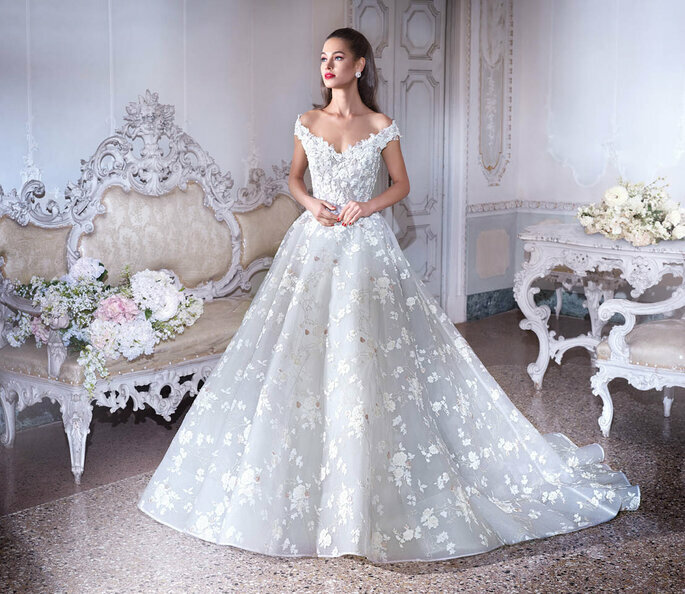 And to be able to make that all-important decision, you should learn about both the old wedding traditions, and the current trends in the bridal fashion industry before buying your dress. Fortunately, this Greek designer has it all, and if you are looking for a collection that combines those traditional elements alongside an unique and modern aesthetic, then you need not look any further. Demetrios emanates a timeless and authentic French aura, and presents a collection that is perfect for the most romantic brides. Keep reading, and get inspired with these exquisite looks! One particular theme of the collection is blooming flowers, shown in a subtle and ethereal style, with the use of 3D details, and exquisitely-designed cuts. These dresses are synonymous with the freshness of the flowers that bloom once more in the Spring time. Other dresses in the collection are inspired by the glamour of Versailles, with a feeling of decadence and luxury que remind us of French royalty and a more traditional era. These are also designs that integrate an ivory color to emphasise the most beautiful and intricate details made in white lace. These dresses evoke all of the wonder and glamour of vintage fashion, adapting them for the modern and romantic bride. When Demetrios deals with textures and cuts, it goes beyond just floral 3D prints or classic lace patterns. Alongside the use of modern fabrics, these dresses also feature contemporary prints that evoke and replicate geometric and scalloped patterns. Undoubtedly the perfect dresses for a modern and avant-garde bride. But if you are a daring bride that is looking to make a statement on your big day, in this varied collection you will also find wedding dresses with capes and beautiful decorative feathers. Feathers that magnificently adorn the entire bodice and run down the skirt, creating a chic and sophisticated air, to make your dress that much more special, and cause a sensation for all of your guests. The traditional wedding veil has been replaced by capes for the millennial bride, who prefer something a little dramatic that will offer them a sense of feminine empowerment alongside a more contemporary style. 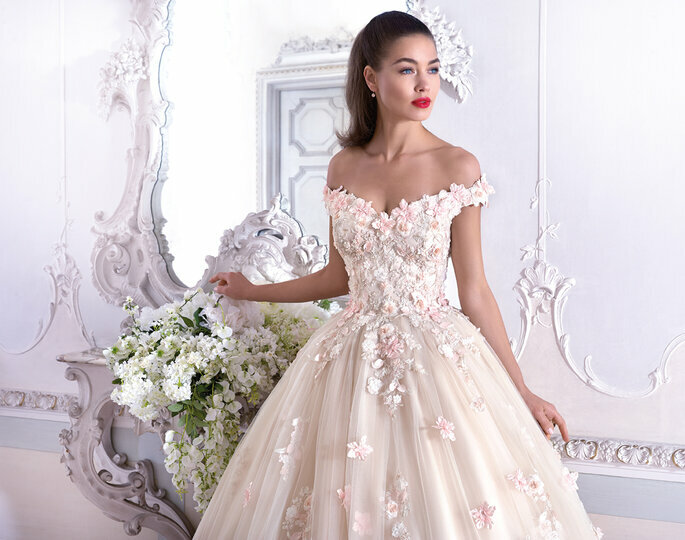 If you love vintage fashion, the collection also offers New Look Ballgowns, where you will find updated versions of the classic princess silhouettes from the 1950s. Here, Demetrios offers a huge variety of skirts with frills and capes that will give any bride a regal and majestic air. 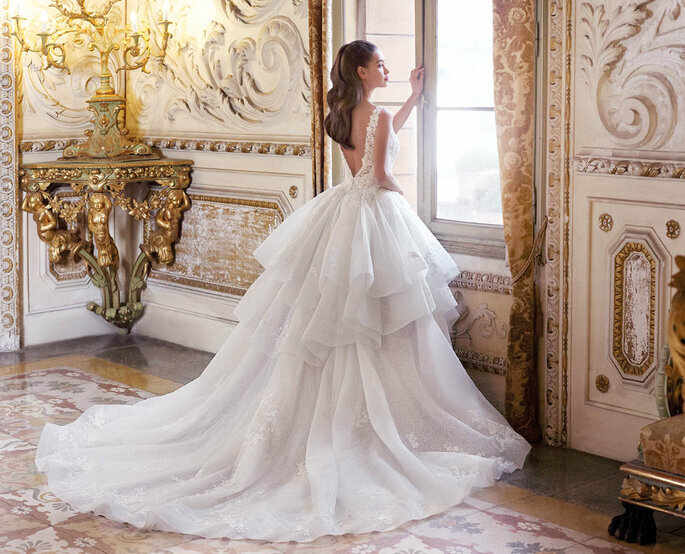 Feel as if you are the star of your own fairytale with one of these voluminous designs with sensual skirts and impressive open backs. Because a dazzling bride does not necessarily have to wear white on her wedding day, Demetrios offers a few alternatives in neutral and pastel colors for these women who are looking for an original look. The pastel blue and pink dresses bring something truly special, with suave shades that are the epitome of romance. Breaking with tradition, but continuing to emanate fairytales – a perfect combination! We hope that you loved this varied, dynamic and marvellous collection. 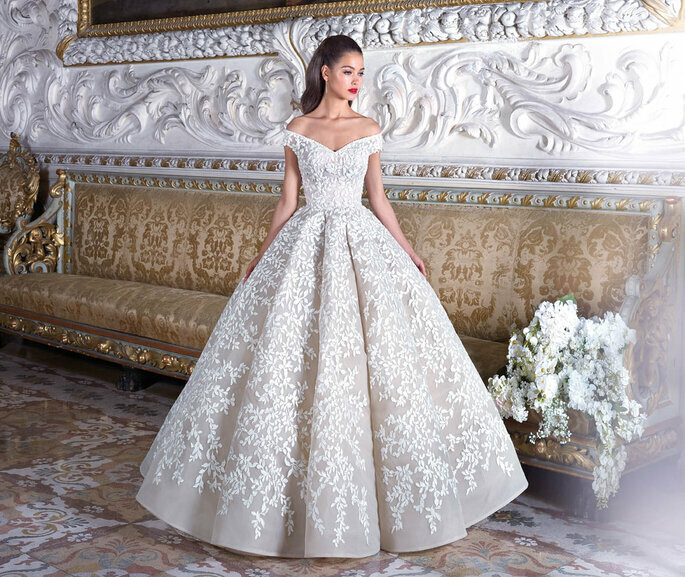 With Demetrios, there truly is a dress that works for every bride’s individual style: looks that are inspired by French glamour, to more modern dresses in 3D, to princess dresses from the 1950s made in contemporary colors. One of these will definitely match your style and personality!